Experiencing a text in an academic setting is always different. I’ve seen Ghost in the Shell before- what self respecting purveyor of all things geeky hasn’t? But never really stopped to consider it as a text to be pulled apart. It was something to passively consume. So, when it was announced as our text for the afternoon I pulled up a lounge chair, busted out the pocky and made myself comfortable for a familiar experience. I would not receive one. Todays class was about experience and reflection, either of the original Godzilla movie or Haji Oh’s exhibition. I chose the latter, and have recorded my thoughts through audio via. soundcloud. I have also included a transcript of what is said for those who prefer to read, accompanied by pictures throughout. Even if you don’t read the transcript, the images may help enhance some of the descriptions. 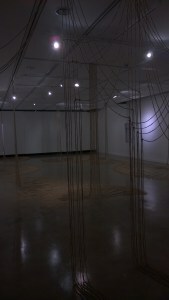 Enter a room with cascades of yarn spilling from the ceiling. Artfully arranged around the room, some falling to the floor and breaking apart as it seeps across the room, while others knot together, intertwining the paths before falling into line across the floor in unison.